With the closure of the SOLive venue we had to shift, and were lucky to be offered a new space in the visitor centre of the Oxford University Museum of Natural History (the 'dinosaur museum'). This page gives details of its location, how to get there, and at the foot, suggestions for eating and drinking in the local area. 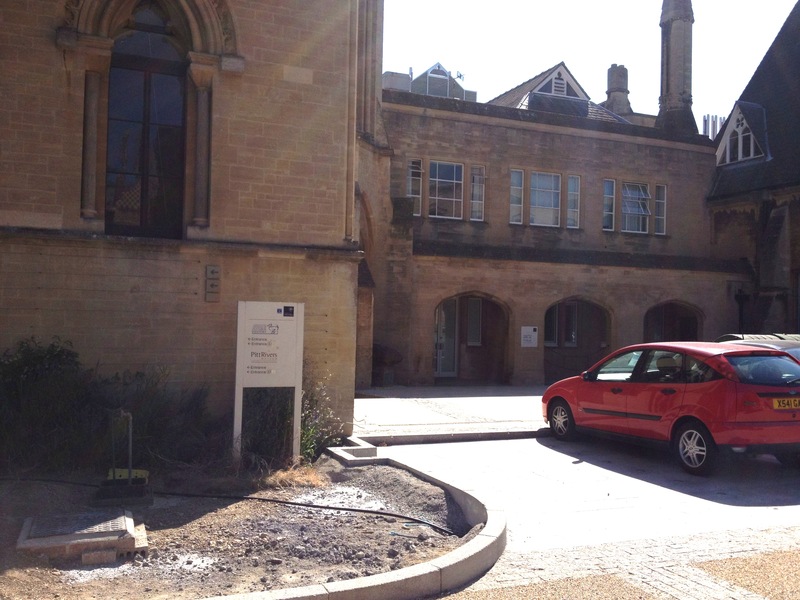 The The OU Museum is located on Parks Road, Oxford, OX1 3PW. 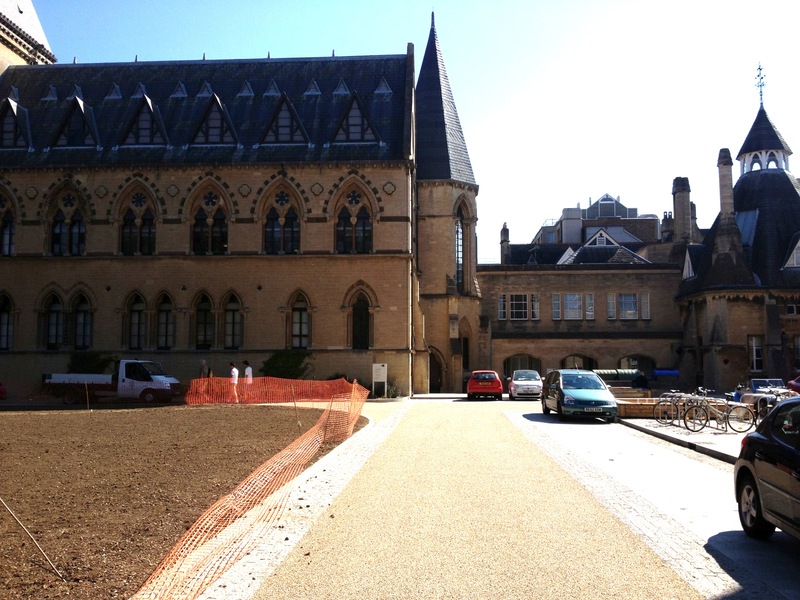 The building is set back from the main Parks Road, with its northern end just about opposite Keble College's Lodge, and its southern end near the junction of Museum Road and Parks Road. See http://www.oum.ox.ac.uk/visiting/map.pdf for a map showing its location in Oxford. The Museum roof was fully cleaned last year and it is now re-opened to the public, with excellent light through the sparkling glass panes. The Pitt Rivers Museum of anthropological items is also open to the public. For the Cafe Scientifique, please come straight to the visitor centre, without going through the Museum main doors. The visitor centre can be seen to the right-hand-side of the main Museum frontage, and can be seen as a series of French window doors set underneath a small colonnade (see left-hand photo, below). Access will be through a side door at the LH side of the windows or through the French windows themselves - the right-hand photo shows the wall in which the door is set. Cycling - Easy to do, and there are plenty of cycle parking racks next to the entrance of the Radcliffe Science Library, to the right of the visitor centre. Driving - non-disabled access - see map and postcode above. Parks Road is accessed from the north via a turn off Banbury Road, and from the east via the Longwall and South Parks Road route. Those coming in from the west, south and centre need to work out which way is best. Parking on the OUM area is controlled by Oxford University's security services, who are very brutal to illicit parkers. If you are an OU staff member and have an off-peak parking pass for the central area, you can use any spare spaces at the Museum or in the nearby science area, after 4pm. If you don't have a pass, then I recommend you do not try to park there! See below for public options. Driving - disabled access - see map, postcode and comments above. There are a few spots reserved at the Museum for those with blue disability parking permits, and they are right in front of the visitor centre (where the red car is visible in the photographs). We can arrange direct access into the meeting room from the car-park, down a slight ramp and then through the French windows, so please just come to the door and ask for them to be opened up. Public parking - There are several nearby streets which have on-street parking a short walk away from the Museum. Rates are usually a single charge of �or �50 from 6:30pm to 10pm, and coins are normally needed (no change given). Streets with this kind of parking include Museum Road, Blackhall Road, Keble Road, Parks Road near Wadham, and Norham Gardens. See the county council information for more details. Slightly further away, there is similar level parking on both Broad Street and St Giles, and there are often many spaces. 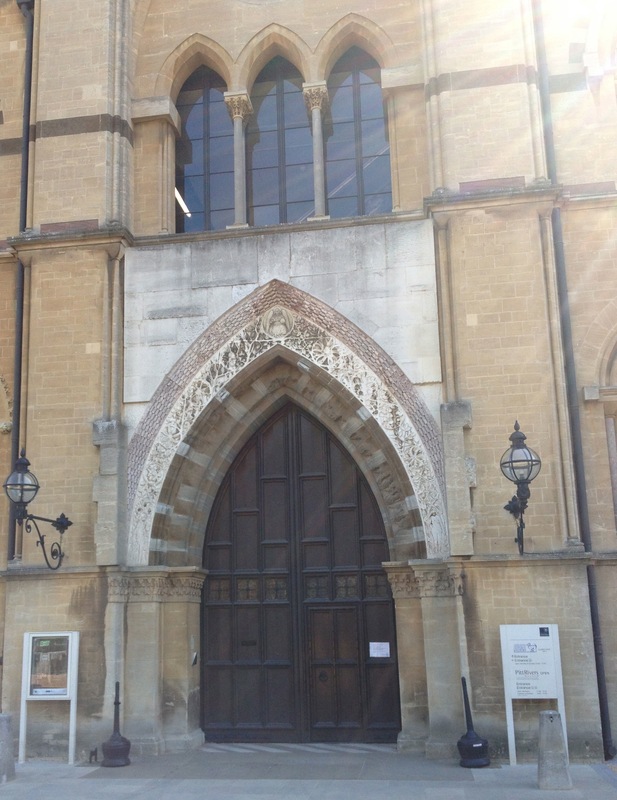 It is usually best for St Giles to park near the Lamb and Flag and walk through their passageway onto Museum Road. For those who like low cost and more exercise, there may be a few spare spaces in the no-pay section of Bevington Road. a short way up Banbury Road. Bus routes - You'll have to get off at Woodstock Road, Banbury Road or one of the town centre stops, then walk. The nearest stop, available from the Banbury Road northern routes (eg 500, 2) is outside the Maths Institute on Banbury Road, just before St Giles begins, then walk up Keble Road or the Lamb & Flag Passage & round to the Museum. For Banbury Road (closest), Oxford Bus Company route 2, and routes X3/X13/13/23; Stagecoach routes 2, 14, 17, S4, S5 and X5; Water Eaton Park & Ride 500; other operators routes 25, 94, 218. For Woodstock Road, Oxford Bus Company route 6, Stagecoach routes 18 (and 17 via Walton St), S2 and S3, Pear Tree Park & Ride 300; other operators 206, 853. For Magdalen Street (further away), Oxford Bus Company route 500 (Water Eaton Park & Ride), route 2 and route 6. The city centre stops for all other routes can be found here for the Oxford Bus Company and here for a combined map of all operators. On this map, the Museum is just out of frame beyond where Parks Road runs off the map - roughly at the "X" of Oxford. The full map of Oxford bus routes, all operators, is to be found at this link. Disabled access and parking as above. The new visitor centre has easy-access toilets, space for coats and bags, and good AV facilities. The Oxford Cafe Scientifique is sponsored by OBN and provides free nibbles, non-alcoholic drinks and 'emergency wine' at every Cafe. However as usual we make no guarantee that there will be any wine left by the time you arrive, so bring your own if you want to be sure, or have a preference for type. The experiment with beer was not very popular, so if you want alcoholic drinks other than wine, please bring your own anyway. Glasses and bottle-openers are provided. Blackwells' Bookshop has agreed to continue their link with us whenever we have a popular science author speaking. They will bring books for a signing/booksale, which will be available as usual after the talk. However, they will not be able to sell other Blackwells books. Any surplus signed copies after such an event will be returned to the Blackwells main bookshop (Norrington room) for resale later. We will not generally sell highly academic books of speakers. Pubs and bars, most of which also serve food - the Eagle & Child and Lamb & Flag on St Giles, the King's Arms at the near end of Broad Street, the Royal Oak at the foot of Woodstock Road, the Plantation Road Gardener's Arms, and the Duke of Cambridge on Little Clarendon Street. I hear decent things of Angels on Lt Clarendon St too, and if Raoul's at the foot of that street isn't having one of its regular makeovers, it's usually good. For a quick bite to eat before the Cafe opens, Green's Cafe on St Giles (shuts at 7pm), Taylor's/Fasta Pasta does good sandwiches, salads and hot takeaway pasta (until 7pm) and any of the kebab vans on Broad Street or St Giles. Alas the new-look St Giles' Cafe (no longer a greasy spoon) closes at 5pm on Tuesdays. A little further away, Walton Street is a hotbed of good cuisine including the legendary Pepper's Burgers, the excellent Manos Greek cafe (shuts at 9pm but does takeaway), a load of Indian restaurants to suit all pockets, Loch Fyne and Posh Fish for top- and bottom-budget fish respectively, Branca, the Brasserie Blanc, Freuds (mostly for their cocktails), Jude The Obscure and the Victoria Arms. Further away, Al-Shami down on Walton Crescent, for Lebanese food. For reviews, locations and opening hours use the Daily Information food guides. This list is not exhaustive and Cafe Sci personnel take no responsibility for the current standard of these operations!